Help! Herp in the House! Living in the concrete jungle of Singapore, being constantly surrounded by high rise buildings, roads and a cacophony of over 5 million people speaking in different languages while bustling about, it’s convenient to think that that’s all there is to our ‘little red dot’. But if you’re game enough, it’s just as easy to have a change in scene and experience a different side of Singapore. And all you have to do is hop on a bus. It’s that simple. The wonderful thing about Singapore for any nature enthusiast is just how accessible nature is. There aren’t many countries in the world where you can take public transport from the city centre straight to the forest in under an hour, or oftentimes much faster than that. Many of us Singaporeans forget about this, and perhaps it’s been taken for granted. Last Sunday evening, some of us went up to the Mandai Park Connector. The moment we got off the bus, we had the honour of being greeted personally by a resident of the Mandai forest – a young monitor lizard who scurried across our path into the neighbouring bushes. While walking along the forest trail looking out for anything that moved, I couldn’t help but feel drawn to the things along the way that didn’t move: like the small number of lone stone walls, an old defunct well and a mysterious opening in the ground off the path with brick walls – perhaps remnants of what used to be a kampung. We weren’t just going back to nature, it seemed like we were going back in time. But I digress. We walked further down the path when Ing Sind suddenly stopped, pointing upwards into the trees right above us. There, lying on a thin branch was the Painted Bronzeback (Dendrelaphis pictus), our first snake of the evening! Looking at it, it wouldn’t have even crossed my mind that the slender white figure would be a snake, because it really looked like just another twig off that tree. Guess it really pays off to look up and change perspective every now and then! Moving deeper into the forest, we heard a different cacophony of voices, this time not from people but frogs. Lots and lots of them. While most amphibian calls tend to resemble something much like a musical belch or fart, there was one call that stood out for us – the call of the Spotted Tree Frog. Its rather mechanical call is highly unique, sounding very similar to a watch’s alarm (‘beep beep beep beep’). Although we didn’t manage to find the Spotted Tree Frog, we did have the pleasure of coming across a number of the other frogs with their less-sophisticated (but nonetheless equally enjoyable) calls. The Black Eyed Litter Frog (Leptobrachium nigrops)was one of them, resting among the leaf litter, and was very easy to approach. Just next to it lay a pool of water, where we observed two species of tadpoles – the ones that were darting around quickly in the water belonged to the Field Frogs (Fejervarya limnocharis), while the ones suspended almost motionless in the water belonged to the Microhylidae family. Further down from the pool of water, we found a number of Four-Lined Tree Frogs (Polypedates leucomystax) – one pausing midway in its journey as if forgetting what it came for, while not too far from it was a couple of them mating strategically above a water source as a home for their young.On the way back, we came accross two Common Asian Toads (Duttaphrynus melanostictus), where one of them was sitting in a hole in a tree trunk. As the walk came to an end, the sound of the Spotted Tree Frog seemed to be escorting us out, though we never did manage to find the frog itself. It is incredible, just how much value and wonder lies right under our noses (or just above our heads) that goes by unnoticed. Perhaps by merely whizzing by too fast down a straight path, being so caught up in reaching a destination, we fail to truly enjoy the process of stopping to appreciate the little hidden gems all around us. And perhaps all we need to do, is take the time to stop in our tracks, take a step back and look up. 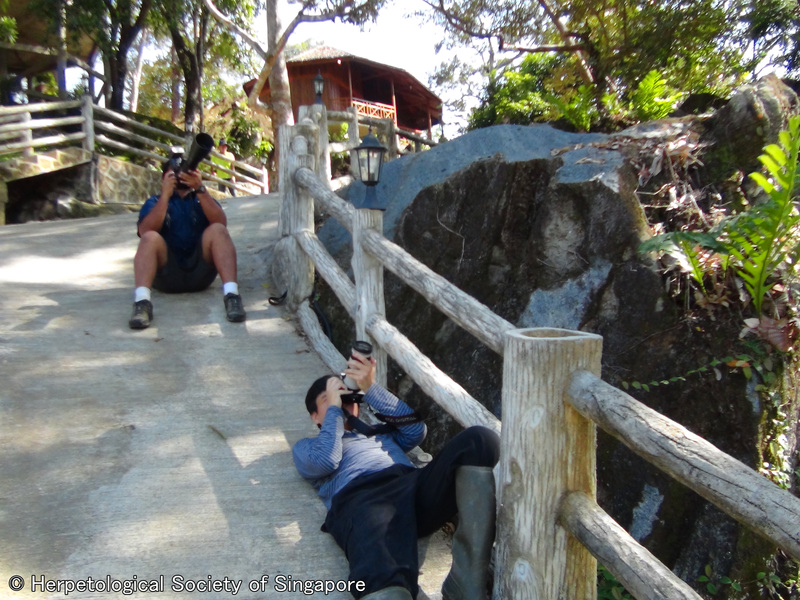 The HSS went on its first overseas herping trip to Bintan from 10-12 April 2015. As far as reptiles and amphibians are concerned, Bintan is a fantastic place to go. 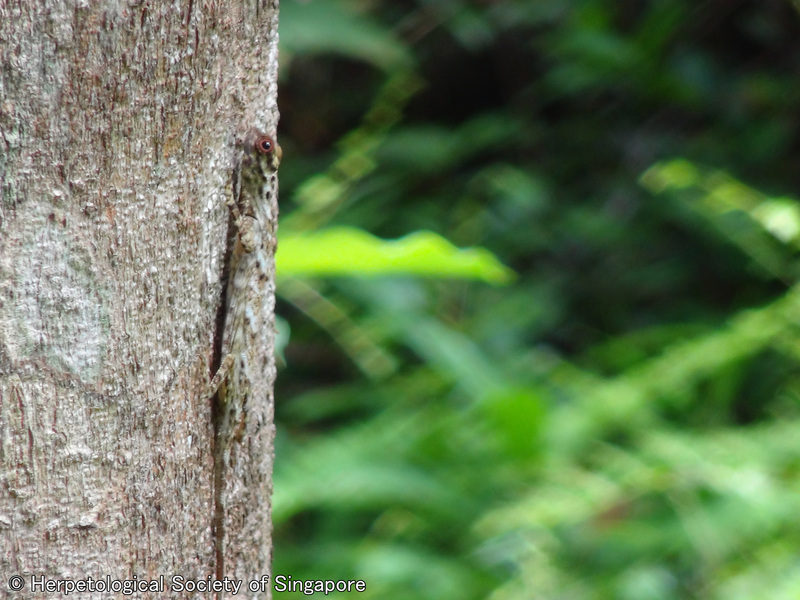 From a previous trip, Ing Sind reported seeing a Kuhl’s Flying Gecko (Ptychozoon kuhli), which is very rare in Singapore. Besides herps, we were really hoping to see the Pale-thighed Surili (Presbytis siamensis rhionis), a subspecies which is endemic to Bintan Island. We arrived in Bintan in the afternoon and took some time to rest, before we got to herping proper. After sundown, the three of us trekked into a wooded area beside the hotel. We started at 10pm (Bintan Time) by walking down to the golf course. We were greeted by this sight. Okay, it doesn’t look that impressive in the photo, but the picture does NO justice to the sight we beheld. 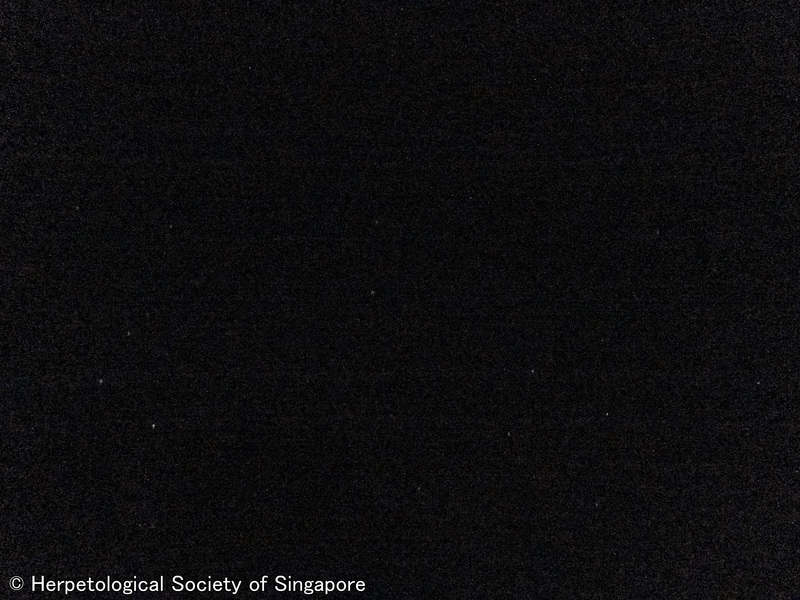 Without any light pollution in the area, the inky black Bintan sky was dotted with tiny white lights. It’s something that you literally never get in Singapore; a sight which, in itself, is worth a million dollars. Reluctantly tearing our eyes off the star-studded sky, we walked into the forest. Barely a hundred meters in, Ing Sind gasped, “Gonyosoma!” At first, I thought he was kidding. I’ve been looking for this snake for 2 years. A quick glance conf irmed that he was telling the truth. It really was the Red-Tailed Racer (Gonyosoma oxycephalum). It’s distinguished from other snakes by its reddish tail, which contrasts spectacularly with its bright green body. And to make it even cooler, it has a blue tongue! As is expected of this species, he was coiled into a tight ball almost 4m up on the tree. After taking some shots, we left him in peace and continued. As we walked along, several interesting insects turned up, including this hawk-moth. Hawk-moths are also known as Sphinx moths. It’s a reference to how their caterpillars tuck their head under their legs when resting or threatened, resembling a Sphinx! After a while, we stopped to look at a small pond in the forest. Noel glanced up at the tree and found a bronzeback on an overhanging branch! Closer inspection revealed it to be an Elegant Bronzeback (Dendrelaphis formosus). It is distinguished from other bronzebacks by its short snout and greenish iris. A beautiful snake from every angle. We walked to the end and turned around, happy to have seen the two snakes. On the way back, Noel spotted an Oriental Whip Snake (Ahaetulla prasina) that looked like it had just eaten something. It was a great way to round off the night. We grabbed a golf cart in the morning and drove around the golf course, in search of some herps. Sadly, we only saw some Changeable Lizards (Calotes versicolor) and this Clouded Monitor Lizard (Varanus nebulosus). The monitor lizard was basking in the sun and got away just as we got close to it. We then went over to Gunung Bintan, the twin-peaked mountain, by car. On the way, Ing Sind’s mum spotted some monkeys in the distant trees. We stopped the car, grabbed our equipment and ran out of the car. Sure enough, it was the Pale-thighed Surili! The shy monkeys quickly sensed our presence and moved away. 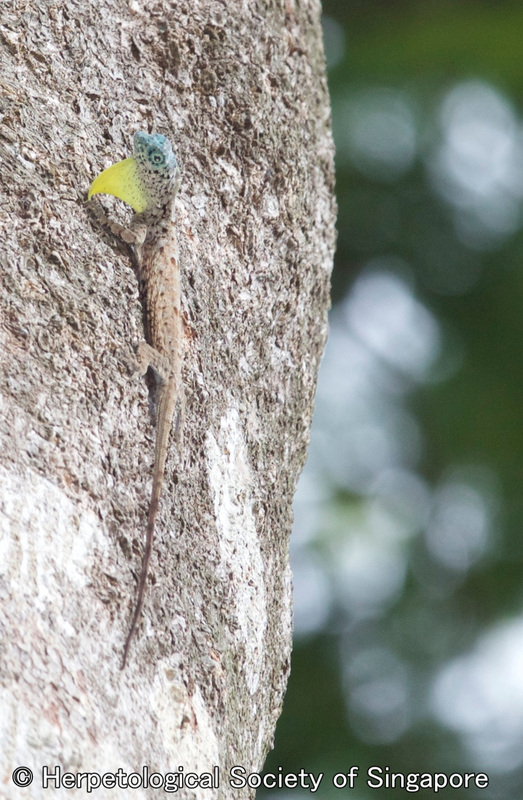 When we got back to the hotel that day, we were amused to find a Green Crested Lizard (Bronchocela cristatella) sitting on top of the roof of the hut. All in all, the trip was a great experience for all of us. We saw several things that we went there to see and several things that we never even expected to see! We definitely recommend Bintan for people who are interested to herp in South East Asia. Just remember to be responsible and ethical in your herping! To end off, here’s a picture of Ing Sind and Noel trying to photograph a Common Flying Lizard (Draco sumatranus) on a tree on the last day. Also, a great picture of the Lizard by Ing Sind! No, it’s nothing to do with STDs. Herpetology is the study of herpetofauna, that is, reptiles and amphibians. The name is derived from the Greek word, “ἑρπετόν”, herpeton, which refers to the creeping nature of the subjects. In Mary Shelley’s Frankenstein, the monster was a strange amalgam of human body parts, scavenged from beyond the grave. In many ways, herpetology is that monster. Confused? Let us explain. When Linnaeus first set out to classify the living world over 200 years ago, amphibians and reptiles were placed together, for understandable reasons. So, much like Mary Shelley’s monster, herpetology is a field that has been cobbled together with other parts! Note: The word “reptile” itself is rather ambiguous. Mammals, birds and reptiles are all classified as amniotes. However, mammals and birds are excluded from class Reptilia. It is a paraphyletic clade that is not universally recognised. However, it persists as a term of convenience. As far as this blog is concerned, the word “reptile” will refer to non-avian, non-mammalian, amniotes. So, what’s up with our logo? We thought long and hard about what animals we should choose to represent the Herps of Singapore. There were several candidates, and we considered all of them seriously. The top center of the badge features the Spiny Hill Terrapin (Heosemys spinosa). This is an attractive forest-dweller that can be difficult to spot amidst the leaf litter. This is a very recognizable ambassador for turtles, tortoises and terrapins across Singapore. Sadly though, it is endangered due to human trade. The Spiny Hill Terrapin represents the danger that the Herps of Singapore (and indeed the world) constantly face. On the right, is the Malayan Horned Frog (Megophrys nasuta). This guy brings amphibian representation to the table and like the Spiny Hill Terrapin, is instantly recognizeable by the shape. The frog has amazing camouflage, mimicking leaf litter almost perfectly. 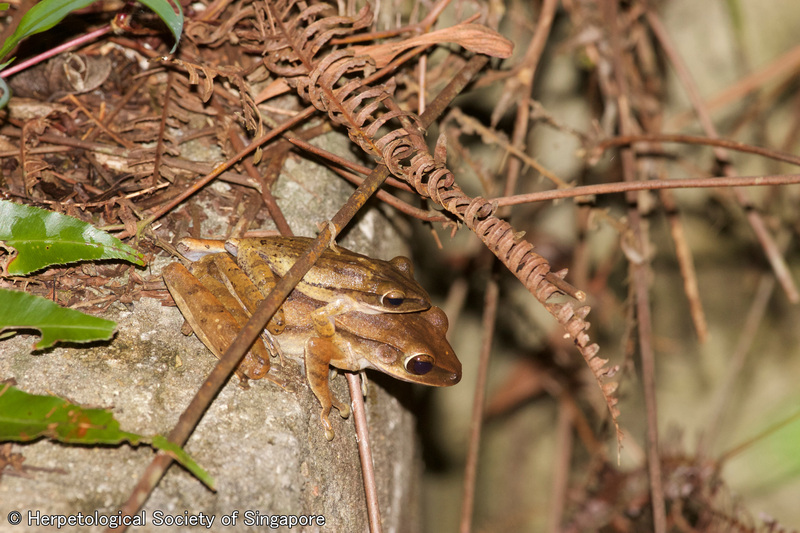 This frog represents the fact that the Herps of Singapore are everywhere, even when we don’t realise. In the foreground, we have the Big-Eyed Whip Snake (Ahaetulla mycterizans). Unfortunately, snakes do not have fantastic Public Relations. They have a bad reputation that is almost entirely unjustified. This guy is a docile, yet beautiful snake that defies stereotypes. Very little is known about the ecology and behaviour of this snake. As such, it represents the overarching theme of mystery and the knowledge that we hope to pursue as a society. Finally, all of our mascots are leaning out of the badge. This represents one of our objectives at HSS, which is outreach. 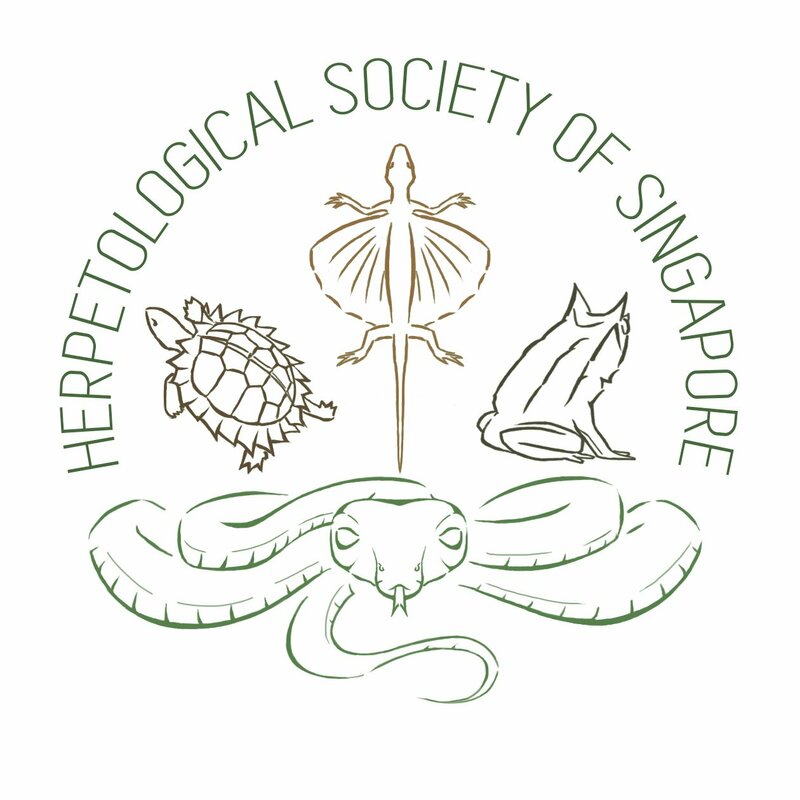 We hope to educate Singaporeans (and everyone else) about our amazing herpetological diversity! With that, we conclude our first proper post on the HSS blog! Enter your email address to follow the HSS blog and receive notifications of new posts by email.